As therapists we often stress the importance children “playing with their food” and spending time experimenting with all kinds of foods for sensory exploration and growing acceptance of new textures, tastes, and smells. 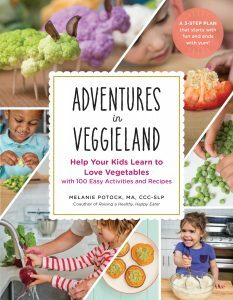 Speech Pathologist Melanie Potock has written a great new book to help parents with imaginative and fun ideas for not only getting kids to play with their veggies, but getting them involved in preparing fun and yummy dishes as well, including vegetables! In the book are ideas regarding strategies for exposing your child to healthy foods, including the therapeutic rationale for this hands on exploration,activities for food science, games and art activities. Examples include Bell Pepper Baseballs, Corny Corn Bread with Honey Butter, Asparagus Log Cabins, Jungle Animals, Magic Spinach Game, and Cucumber Caterpillars. Here is an excerpt from the book, a recipe for Polka-Dot Green Dragon Smoothie, which is guaranteed to be a kid pleaser. Total Time: 10 minutes Serves 4 to 6. · Blend all ingredients except the chocolate chips in a high-powered blender until they are smooth, adding a splash of water as needed if using all frozen fruit. · Add the chocolate chips and blend for just a few seconds to create polka dots throughout.